Happy 25th to Batman ’89! Tim Burton’s Batman (1989) opened in theaters 25 years ago today! I saw a 10 p.m. showing opening night at my local mall multiplex (I think it had a whopping 4 screens back then). It was amazing for 8-year-old me to be out that late. I remember feeling mixed about the movie. Batman was awesome, but there was too little of him. Some of the violence and darkness got to me (per design, I guess). The Batplane flying up to the moon made me groan. There was so much I loved, though. The jet-powered Batmobile. Bruce Wayne’s cool detachment, played with a dash of weird by Michael Keaton. The terrifying yet hilarious Joker. The gags. The costumes. The music. The hyper-reality of it all. I left the theater exhausted. On one hand, I felt like the movie didn’t quite capture the character I knew from comics. On the other, whatever alternate universe Batman world that had just unfolded before me had been a hell of a unique ride. 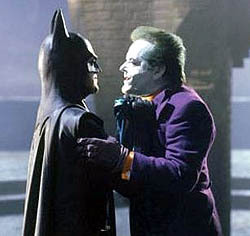 The movie’s energy and the late showing made seeing Batman in 1989 one of the major movie-going events of my life. This entry was posted in Movies and tagged batman, batman 1989, batman 89, Jack Nicholson, joker, Michael Keaton, movies, Tim Burton. Bookmark the permalink.